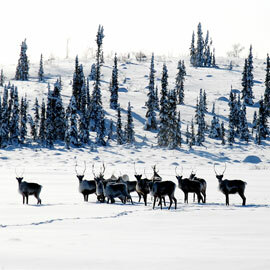 Waterloo – Northwest Territories biologist Jan Adamczewski and Tłı̨chǫ Nation government representative John B. Zoe will present a guest lecture at Wilfrid Laurier University on declining caribou populations Feb. 5 at 2:30 p.m. in the Paul Martin Centre. The joint presentation is hosted by William Quinton, director of Laurier’s Cold Regions Research Centre, and Colin Robertson, associate professor in Laurier’s Geography and Environmental Studies program, through the Global Water Citizenship project funded by Global Water Futures, the largest university-led water research program funded worldwide. The guest lecture entitled, “History of Bathurst Caribou and the Tłı̨chǫ People: Managing in a Time of Scarcity,” will provide an overview of current Bathurst caribou management practices and the history of Tłı̨chǫ adaptation to fluctuating caribou abundance with historic influences like the fur trade. Find out more about Laurier’s northern research initiatives.